Shop Harley Davidson Softail Springer FXSTS Saddlebags. 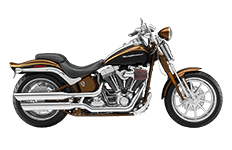 Within the Harley Davidson Softail model class, the Springer bikes offer riders both convenient comfort and hard styling. For owners who like to accessorize with only the best in aftermarket products, we believe that Viking Bag's lineup of luggage specific to this Harley have created the perfect match. Full of saddlebags with bold lines, sleek design aesthetics and toughened exteriors, you simply won't find a better selection of saddlebags anywhere else.